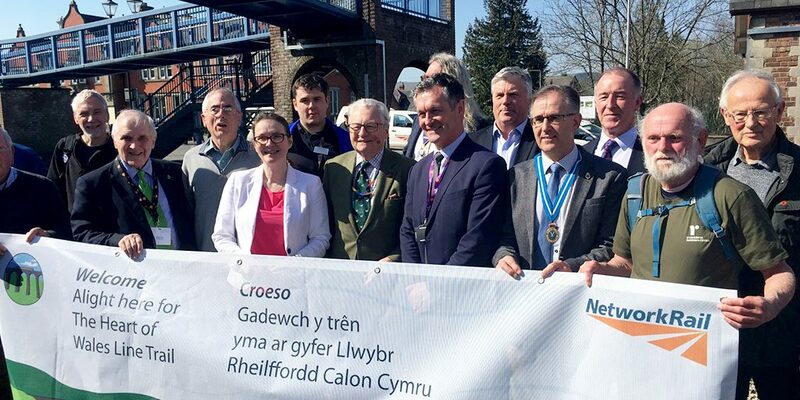 Launch of the Powys section of the Heart of Wales Line Trail at Llandrindod Wells Station. A good crowd of people turned out for the much anticipated launch of the Powys section of the Heart of Wales Line Trail. The trail weaves between stations along the Heart of Wales Line, offering visitors and walkers a chance to explore Wales and the Borders by rail and on foot, without the car. Completion of the long distance trail has attracted international media attention and it recently featured in The Guardian’s Best Travel Discoveries of 2018. The Powys launch took place at Llandrindod Wells Station on the 28 March. The opening ceremony was held at the Media Resource Centre in Llandrindod Wells, with the official launch on Llandrindod Wells Station. After the launch many of the attendees took part in the guided walks which were arranged so that people could explore the newly-opened section of the Trail. The event was organised by the Heart of Wales Line Trail steering group. Geraint Morgan, community affairs manager at Transport for Wales said, “The Heart of Wales line has always been a vital link in serving the local communities and this is another example of Transport for Wales working in partnership with the communities we serve to boost the local economy and tourism. The second walk to Pen-y-bont, organised by Four Wells ramblers included a stop to sample delicious home made cakes and fresh local produce at The Thomas Shop in Pen-y-Bont. The Trail steering group would like to thank Powys Rights of Way Team for all their hard work on this stunningly beautiful section of the trail. It has been a lot of hard work and is much appreciated. If you are keen to walk the Heart of Wales Line trail this year, the route book written by local lad and designer of the trail Professor Les Lumsdon, is now available to purchase from Kittiwake Books of Machynlleth. It includes all the maps and route descriptions for the trail.